Sims Realty, LLC is in the business of helping families buy and sell homes and properties. Our goal is to help our clients make the best decision by providing lots of information, specific details, helpful hints and no surprises. We understand that you don’t buy or sell property every day, and we pride ourselves in guiding you through the process. 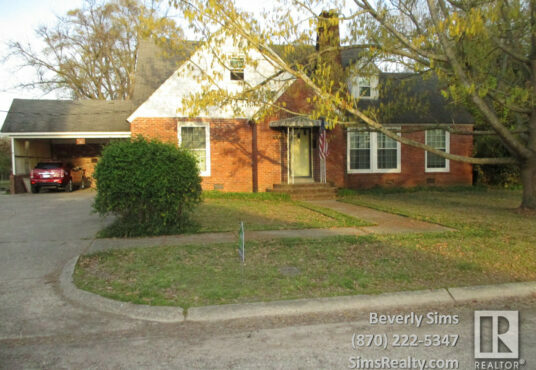 Beverly Sims has been a Realtor since 1995, and the Broker/Owner of Sims Realty, LLC since 2007. 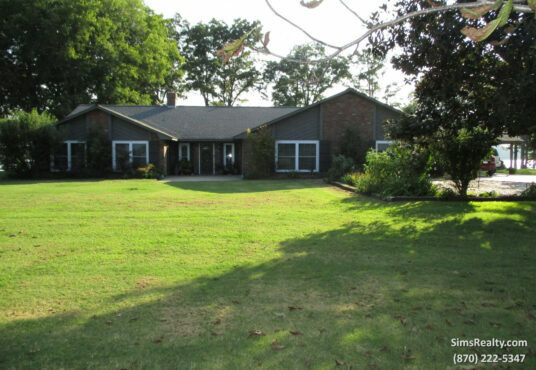 Beautiful Home on Lake Chicot with great views of the sun setting! There are mature fig trees, pecan trees, muscadine vines and blueberry trees. Approx. 164′ of lakefront Gravel Bream Bed Seawall and a dock w/electric lift, storage, ladder, covered area w/electricity, built-in mini fridge, & sink with fresh water. Also has a double carport with patio area on the back. The den has a lake view, hardwood floors, gas log fireplace with blower and remote control, and solid oak built-ins. The back of den opens to the sunroom and French doors open to the hall and foyer. The breakfast area also opens to the sunroom. – Heating & Cooling: New Central H/A in July of 2018. There are two water heaters and two attic fans. – Roof: A thirty year architectural roof was put on in 2011. – Windows: All exterior windows replaced in June of 2013, by Windows USA with a Lifetime Warranty that is transferable. [Alaskan Energy Star and Easy Clean Access]. – Bedroom Remodel: Complete remodel of the master bedroom and bathroom was done in the summer of 2017. – Garage Doors: openers replaced in June of 2018. – Outside: stain new in July of 2018. – Sprinkler system: Programmable auto on/off with adjustable zone and timing, installed in 2014. The pump supports the sprinkler system by using lake water. – Security: The owners purchased their Vivint security system in 2016 and will leave it for the new owners. – Bedroom 2: walk-in closet and new carpet. – Hall Bathroom: has a tub shower, double vanities, and a wall of storage cabinets. – Storage: The attic is partially floored with double access and additional storage over the large carport. There are two extra walk-in closets and two linen closets in the hall near the other three bedrooms. The utility room has storage, a pantry, and a large broom/supply closet. The sunroom has a walk-in storage closet with barn door. 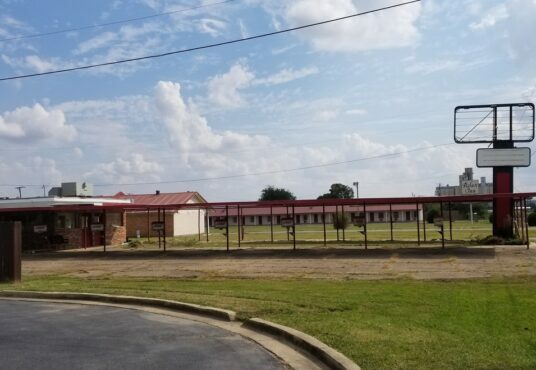 This property is located on the 4-lane, Hwy. 65, which is a main artery, running north and south through the state. The lot has 150′ of highway frontage and is 342′ deep, joining Walmart on the south side and the Lucky Garden Chinese restaurant on the north side. The 20’X40′ metal building does stay with the property. It has been remodel and was previously a store. GREAT LOCATION! 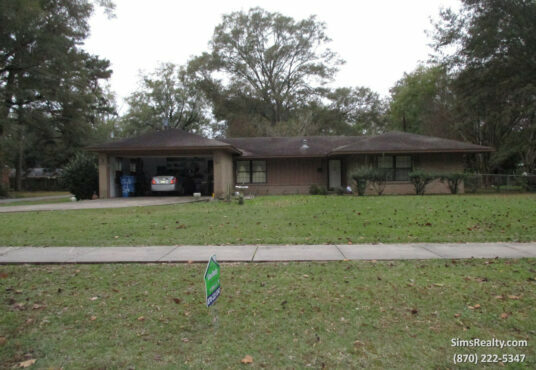 If you are looking for a nice home in a nice neighborhood, you must check this one out. This home is 1144 sq ft, and has 3 bedrooms and one bathroom. It has had several improvements made to it the last three years. The bathroom was remolded 3 years ago. The kitchen cabinets were painted six months ago. 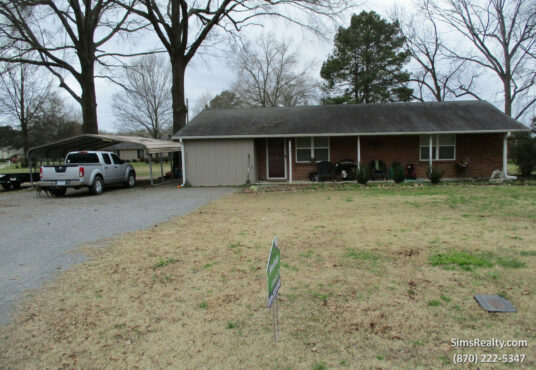 New custom windows, with lifetime warranty and which flip out to clean, were installed by South Arkansas Siding & Windows about three months ago. All new flooring throughout the entire home was recently installed by Lisa’s Floors and More. New carpet is in the three bedrooms, and new vinyl in the bathroom. The rest of the house is Firm Fit PVC planks that look like wood. They are beautiful as you can see in the pictures. The Trane central heating and air is only 6 years old, and the roof was replaced in 2011. The house is on a 1.07 acre corner lot. New 10 x 16 storage building which has electricity, and a 10 x 16 lean-to behind it. The new storage building and new washer and dryer are negotiable. 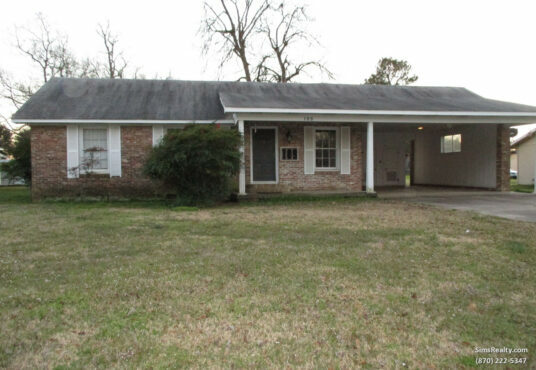 This is a nice, well maintained home, with a large chain-linked fenced backyard. It has a partially covered patio, with french doors opening to it from the den, that has a nice gas logs fireplace. This home has two spacious bedrooms with large closets. One is the master bedroom with a master bath, and the other bathroom is in the hall. There is a nice dinning room with a unique ceiling. The laundry room has a washer and dryer that stay, and there is a craft room adjoining it with a large storage room for a freezer or whatever you’d like. The back door in there also goes out to the patio. The kitchen has a nice range, dishwasher, and refrigerator that all stays. It also provides the safety and convenience of a garage. Did not flood. Nice house with hall bathroom that is totally new. Stainless steel refrigerator stays, along with all of the kitchen appliances. The dishwasher is also stainless steel. It has a formal living room and a den, with a very unique, round shaped fireplace. This house and fireplace was built and bricked by the owner, Bob Henry, a long time Masonry in this area. The dbl carport has a large storage/ shop area on the north side and there is also a red barn storage building. The new central H/A unit has just been installed. It also has an extra lot, that comes with this property. This was formerly Bumpers, and lastly was the Southern Drive-Inn. 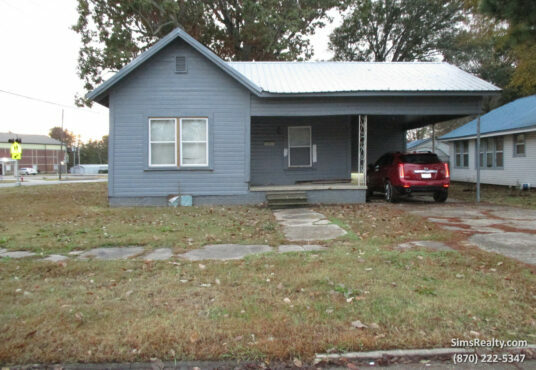 The listing price is $32,000, and it’s located at 1108 Hwy 65 N., McGehee, AR. Located on Hwy. 65 between two motels: Best Western & Super 8. Hwy 65 is a main four-lane running north and south through the state. 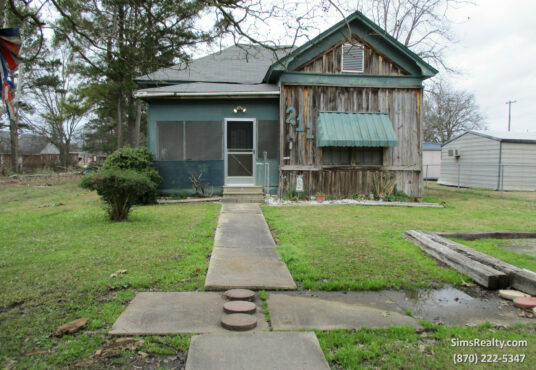 This 3 bedroom, two bath house is 1312 sq ft. The master-bedroom has its own bathroom with a ceramic tile shower, and a whole wall of closet space. The hall bathroom has a tub/shower. The living and dinning room have very nice looking hardwood floors. There may be hardwood floors under the carpet in the two front bedrooms and hall. The kitchen has a bar and plenty of cabinets, with a pantry/storage area in the utility room. There is also a closet in the washer and dryer area. The washer and dryer remain as well as the kitchen appliances. The roof was replaced less than 10 years ago. The house has a very nice screened-in porch. The backyard is a good size with a large storage building and a fenced-in garden area. There is a two car parking pad in the front yard. The lot is 5o feet wide but is 175 feet deep. Price Reduced from $29,000 to $22,500. 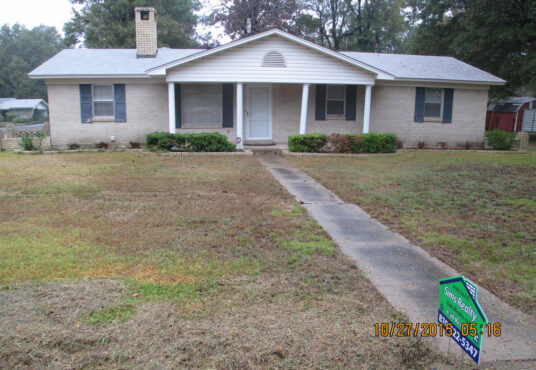 This is a fixer-upper that is partially done, with almost everything you need to finish it. 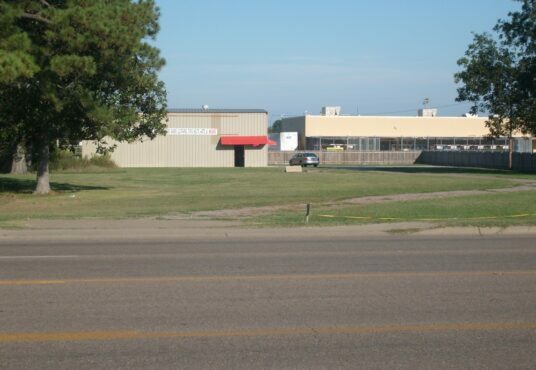 It is located on two lots, on the corner of N. 4th and Holly St., across the road from the McGehee Library. The metal roof is new and so are the double pain windows. The exterior of the house has been recently painted. Come see what has been done, and what is left to be done to make you a nice comfortable home. If you would like to view any of the properties above, or any other properties in the area, call Beverly Sims at 870-222-5347.